I started with this recipe and I modified it as I went a little bit. I left out the sweetener as I didn’t want to use honey for the babe and I forgot to sub it, lol. But really, she doesn’t need a sweetener. I realized I prob could tinker with throwing in a banana which I will probably do next time and adjust some of the wet ingredients. I also used almond flour because I don’t keep regular around anymore, and I had to use maybe twice the amount to get the right consistency. Again, I probably need to experiment with that more to get the exact right consistency. BUT I bet if you followed the recipe as it was written it would turn out great. I cooked them on a low heat and didn’t rush as I know sometimes with almond flour things can burn quickly, but I was pleased with how they turned out. I froze most of them on a cookie sheet in a singe layer and transferred to a freezer bag once they were mostly frozen. This will make it super easy to defrost as needed. What we cooked last week! OK a QUICK rundown of what we ate last week!! 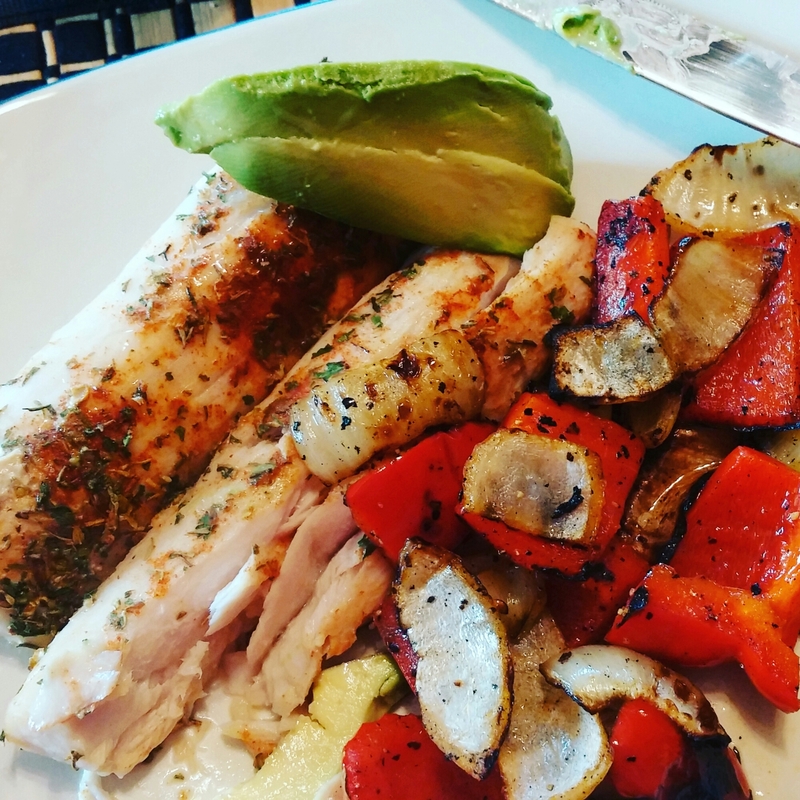 Monday: Simple Roast Chicken and veggies – I mentioned on insta that I spent the extra money for a roaster chicken from Trader Joe’s. Seriously – do it. You don’t know what you are missing! Currently testing out places for locally raised chickens, stay tuned for details. For cooking it, I do some EVOO, thyme and garlic rubbed all over before I cook it about 30-40 mins @ 450 and then 20-40 @ 400. Cooking time varies based on how defrosted it is and how big. Do yourself a favor and get a meat thermometer. It’s just way easier than guessing and since I’m spending more money on my meat, I want to get it right!! The veggies are whatever we have hanging around, generally onions, peppers, potatoes (regular and sweet), snow peas, mushrooms. Tossed in EVOO and seasoned however you like – I’ll post my favorite marinade next time we make it that way – but these were not fancy. I put them in for the last 30 mins of roasting the chicken. TA-DA. Tuesday: Lunch salad – cucumber, tomato, cheddar cheese cubes, onion. I was able to make this and eat it before the child’s nap was over!! Tuesday: Chicken stock!! Based off recipe from Against All Grain found here – this is super super easy, good for you and a great way to get the most for your money when you buy the good chicken! When it’s done I strain it through a cheesecloth and I freeze some in ice cube trays and some in jars for cooking with over the next few weeks. Saturday: Sausage and Peppers from Against All Grain’s “Meals Made Simple” cookbook. She serves it over sweet potato noodles, but we used brown rice pasta. It’s not on her site, but hit me up to borrow her book! We love it and this was a big winner with the husband. So I’m counting this in the win column. I used yellow squash, red pepper, onion and a mix of sweet potato and regular white potato. Hubby cracked the eggs into their spots much better than I could have done, and we baked it for about 13/14 mins because we wanted our eggs cooked pretty well. Sorry my picture was terrible, but I promise it tasted great! Easy and quick tonight, mahi mahi filets were Trader Joe’s (frozen) and I mixed up this quick spice rub and baked them for about 25 mins (they were still partially frozen) . Our veggies are done this way quite a bit in the warm weather, coarsly chopped and drizzled in olive oil, a little Montreal seasoning and grilled in our much loved grill basket. If it ain’t broke, don’t fix it! This caught my eye because, goat cheese. Need I say more? I think I would up the goat cheese (surprising?!). I pulled it out of the oven around 20 mins b/c the top was browning, but I think I’ll leave it for the full 30 to get the cauliflower nice and roasted. Let me know what you think! With the cold weather Sunday night, we opted for some slow cooker deliciousness. I modified a bit as this was my second time making it. I loveloveloved the colors this combo of veggies gave us and it was a good amount to feed the husband and I and give us leftovers for the next night.